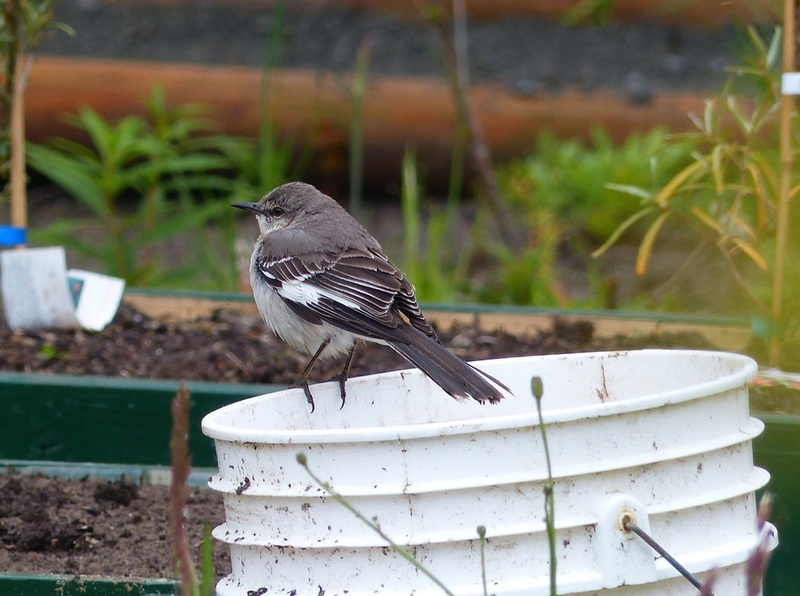 This northern mockingbird was seen near the Hakai Institute lodge on Calvert Island. This is far north of its usual range, though casual appearances of this species outside its range are not uncommon. Photo by Brian Starzomski. This medium-sized songbird is grey-brown with paler undersides and a faint dark eyestripe. It has long legs, a relatively long tail, and a long thin bill that curves slightly downward. It has two white wingbars on each wing, and white outer tail feathers. Its song is the most conspicuous thing about it: it sings almost constantly, mimicking the sounds of birds and frogs nearby and mixing those sounds with its own song. The varied song consists of a series of phrases, with each phrase repeated 2-6 times. Click here to listen. The northern mockingbird doesn't avoid human activity, and can be found in open grassy areas with high perching areas nearby. It inhabits towns, residential areas, parks and backyards, forest edges, and open fields with thickets. Its range is mostly restricted to the United States, southern Ontario, and the Canadian Maritimes, though it is occasionally spotted in more northern regions and may appear as far north as Alaska. Find more information at the British Columbia Breeding Bird Atlas here. Other grey songbirds include the northern shrike (Lanius excubitor), Townsend's solitaire (Myadestes townsendi), and the grey catbird (Dumetella carolinensis). The northern shrike has black mask and black wings with no white wingbars. Townsend's solitaire is uniformly grey with a bold white eyering. The grey catbird is dark grey with a darker cap and no white wingbars. Northern mockingbirds can be very aggressive when defending their territory. Both males and females sing in the fall when claiming their territory. The song of a mockingbird recorded in Massachusetts incorporated songs from 36 different species. Dunn, J. L. and Alderfer, J. (Eds.). (1999). National Geographic Field Guide to the Birds of North America. (3rd Ed.). Washington, D.C.: National Geographic Society. Pp. 354-355. Northern Mockingbird. The Birds of North America Online (A. Poole, Ed.). Ithaca: Cornell Lab of Ornithology. Retrieved from the Birds of North America Online. Accessed 18/08/2014. Northern Mockingbird Mimus polyglottos Audubon Birds. National Audubon Society. Accessed 18/08/2014.